How does the BlackBerry L-Series device size up to the iPhone 5? Yet another photo of Research in Motion's upcoming BlackBerry 10 L-Series leaked online Thursday, though the latest image adds a new dimension to the speculation. 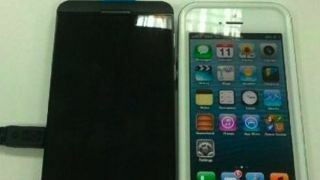 That is, the photo shows the BB10 phone snuggled up next to Apple's iPhone 5. RIM is keeping a tight lid on any news related to the new BlackBerry L-Series and its BlackBerry 10 OS, despite fans' patience wearing thin after seemingly interminable delays. Thus, Thursday's leak marks the first time the BlackBerry L-Series has been directly compared to another device - and it's not an unfavorable comparison. A bigger screen - what else? With the L-Series and the iPhone 5 sitting next to one another, it's easy to see that the L-Series carries a larger display and a slightly bigger chassis overall. Conspicuously absent from the L-Series is the iPhone's prominent home button, a feature that Apple continues to indulge in while other smartphone makers turn instead to multi-touch controls. In addition, there's no front-facing camera evident on the BlackBerry L-Series - though that doesn't mean it doesn't have one. One commenter on BB community site CrackBerry suggested that the front-facing camera is hidden, which should be considered an interesting bit of speculation until more L-Series specs surface. BlackBerry 10: doomed to fail? At least one analyst, Pacific Crest's Securities' James Faucette, claimed in early November that RIM's new BB10 OS will be dead on arrival. However, the device maker's future may hinge on BlackBerry 10 and it probably won't be so black and white - RIM's not likely to go down without a fight, at least, when BB10 launches in late January. And there is at least one market that won't stop using BlackBerry any time soon: government organizations, which no doubt appreciate RIM's high security standards. The tech world is eagerly awaiting more concrete information regarding the BlackBerry L-Series (as well as the QWERY-packing N-Series). But until then, these regular image leaks (the first in September, a video in October and another in early November) will have to do.